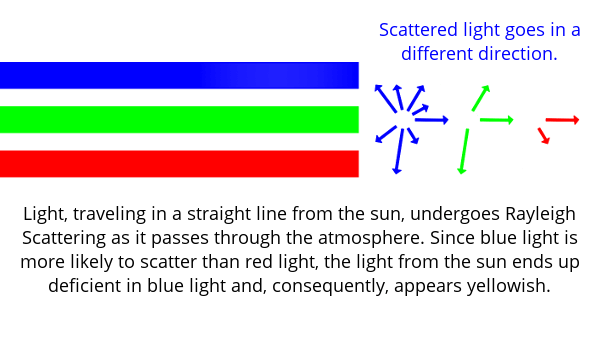 Why does light scatter in the atmosphere? What do blue skies and a yellow sun have in common? What happens when you remove blue from white light? The sun is actually white, not yellow. It only appears yellow because of the Earth’s atmosphere. If you observed the sun outside of the Earth’s atmosphere, it would appear white. The reason the sun appears yellow is the same reason why the sky is blue: Rayleigh Scattering1. Rayleigh Scattering occurs when light interacts with particles smaller than 1/10th of the light’s wavelength. The most common particles are molecules of nitrogen and oxygen (which make up about 78% and 21% of the atmosphere, respectively). Blue light is about nine times more likely to scatter than red light and two-and-a-half times more likely to scatter than green light. Light travels from the sun in a straight line. If there was no scattering, the sun would appear white and the rest of the sky dark. 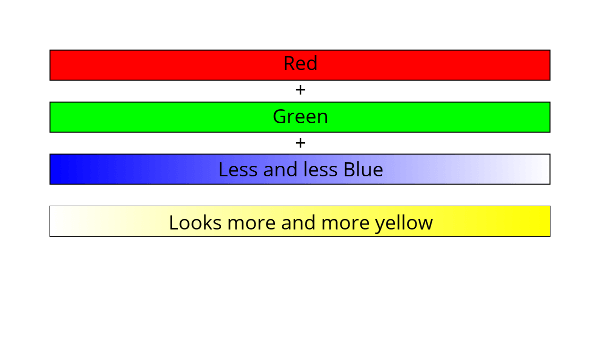 Because of Rayleigh Scattering, significantly more blue light is scattered away than red or green. Since more blue light is scattered away from the sunlight (i.e. direct sunlight has less blue light), the light takes on a yellowish tint. An appropriate combination of red, green, and blue light (as emitted by the sun) appears white to us. As we reduce the amount of blue light, the colour becomes increasingly yellow. The sun is white. Rayleigh scattering makes it appear yellow. 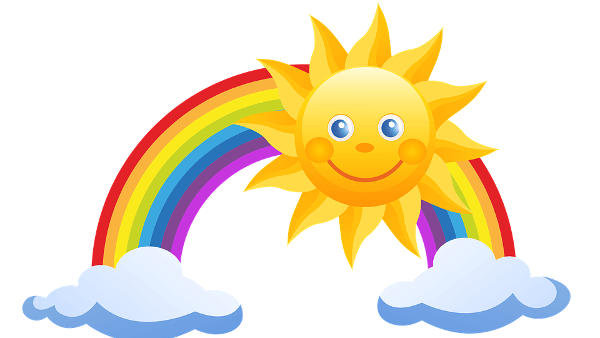 Rayleigh scattering makes the sky blue and the sun yellow. The less blue there is in sunlight, the more yellow it appears.